southern orders : VATICAN II: REFORM WITHIN CONTINUITY OR DISCONTINUITY WITH THE CHURCH'S PAST? VATICAN II: REFORM WITHIN CONTINUITY OR DISCONTINUITY WITH THE CHURCH'S PAST? The bishops of the world at the altar of the Second Vatican Council during the Second Vatican Council! 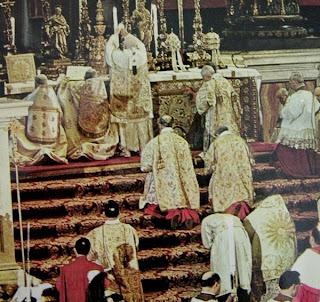 Believe it or not, this is the Holy Mass of the Second Vatican Council, celebrated during the Second Vatican Council! In February of 2009, America Magazine printed an article by Father Joseph Komonchak on Vatican II and Pope's Benedict's emphasis that the reform of Vatican II is "reform within continuity" rather than "discontinuity" with the Church prior to Vatican II. You can read this excellent article by pressing this entire paragraph. No one should be deceived by anyone. Vatican II did not change any dogmas of the Church or any doctrines that are a part of the Church's Ordinary Magisterium. This is a fact. What Vatican II did do is to change in a major way the "theology" of expressing doctrine and dogma. The Council also recovered some aspects of theology that had been neglected in previous eras. It also changed the "hermeneutic" of how the Church was going to engage the world in general and those of other faiths or no faiths at all. There was a special outreach to the Easter Orthodox Churches and "Separated Christians" of the Protestants "communions" or denominations. This was in fact a new approach, but nothing new in terms of dogma or doctrine. While Vatican I emphasized the role of the Magisterium in the Church, in particular the papacy, Vatican II also emphasized the role of the laity in the Church and the world. It did not change the doctrine of the hierarchical nature of the Church one iota. It simply taught that the laity are called to holiness. Their primary role is in the world, especially in their homes and in their secular endeavors. I would suggest that the vision or theology of Vatican II in this regard has not completely caught on with a good number of our Catholic politicians and others in the public arena, to be lamented for sure. As for the Mass, the Council simply set forth some principles for the reform of the Tridentine Mass, but gave almost no specifics. "Noble simplicity" is often quoted, but there can be a wide range of opinions as to what this means. For example a "Low Mass" has a noble simplicity that a "Solemn High Mass" does not. Complicated concert music for the Mass has a complexity that the noble simplicity of Gregorian does not have. The Council called for active participation in the Liturgy. This was already being emphasized for most of the 20th century and certainly by the late 1950's it was taking hold in the Tridentine Mass. But active participation also means immersion into the spirituality of the Liturgy, not just mouthing words. A priest might not be totally engaged in what he is celebrating, although he's actively speaking for most of the Mass. There are spiritual and physical qualities that are necessary for active participation for the clergy and laity even when no sounds are being uttered. So the theology that the Church employs certainly did change with Vatican II. Doctrine and dogmas did not change at all. Older teachings and doctrines that were neglected were recovered, especially the nature of the Church (ecclesiology) and a recovery of the fuller understanding and appreciation of the laity's call to holiness and active participation within the hierarchical nature of the Church. Pope Benedict is not going backwards with his agenda of "Reform within Continuity." He is helping the Church to make a quantum leap forward in the correct interpretation of Vatican II. It is much appreciated and most needed today! Sorry, sounds like double talk. It may very well be so..Focusing on an unused or neglected theology, however setting aside the other will cause the same problem 100 years down the road. Will we then return to the former theology that has been neglected since 1970? Would have been better to re-emphasize and ADD ON. Don't suppress one for the other..It is like turning the Church upside down. We now find ourselves standing on the ceiling. How disorienting. Actually the last comment was disorienting! I'm tired of hearing about Vat II. It doesn't matter what the intentions were. What we got was something entirely different. "Consequently it is not from Sacred Scripture alone that the Church draws her certainty about everything which has been revealed. Therefore both sacred tradition and Sacred Scripture are to be accepted and venerated with the same sense of loyalty and reverence." Vatican II showed that traditions should be kept with loyalty. KIDS SAY THE DARNDIST THINGS! MY CHARISMATIC JOY AT ONE MORE DEAD RAT! Fr. Z. Picks Up My Rats! Not Really! THE VERDICT IS IN, MIKEY LIKES IT! A DOUBLE STANDARD IN REPORTING? WILL IT HAPPEN OR WON'T IT? RCIA IS CONTINUING AT ST. JOSEPH CHURCH! THIS IS THE LAST STRAW; I CAN'T TAKE IT ANYMORE! EMAIL OF A FIRST TIMER AT THE EF MASS! OUR 2010 STEWARDSHIP RENEWAL VIDEO!